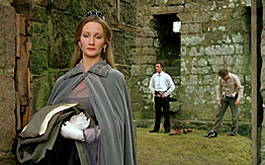 Richard Hanney (Robert Powell) and David Hamilton (Miles Anderson) swap clothes in ruined Morton Castle while Alex Mackenzie (Karen Dotrice) studiously ignores the goings-on behind her back. 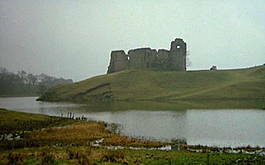 Morton Castle is located near Thornhill in Dumfries and Galloway. It was built in the 15th Century by the Earls of March and abandoned around 1715. The castle is now in the care of Historic Scotland and open all year round with no admission charge.